What Would a Multi-Fountain-Pen Look Like? 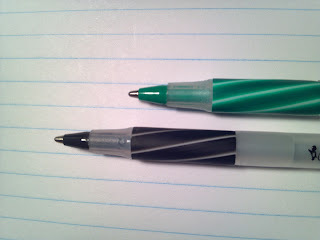 Could one fit multiple fountain pen points in a single pen without it being too large? Would it be possible to make a pen that cycled through different nib sizes? Could three ultra-slim cartridges fit into a pen, allowing one to have a variety of fountain pen inks in a single barrel? I am curious to know if anyone else has ever thought of this or what it might look like. If you are artistically inclined, would anyone be willing to try to sketch a prototype? Even if you're not an artist, what do you think it would look like or how it would work? This Uni Pin came from one of my recent Jet Pens orders, as I indicated in this posting. 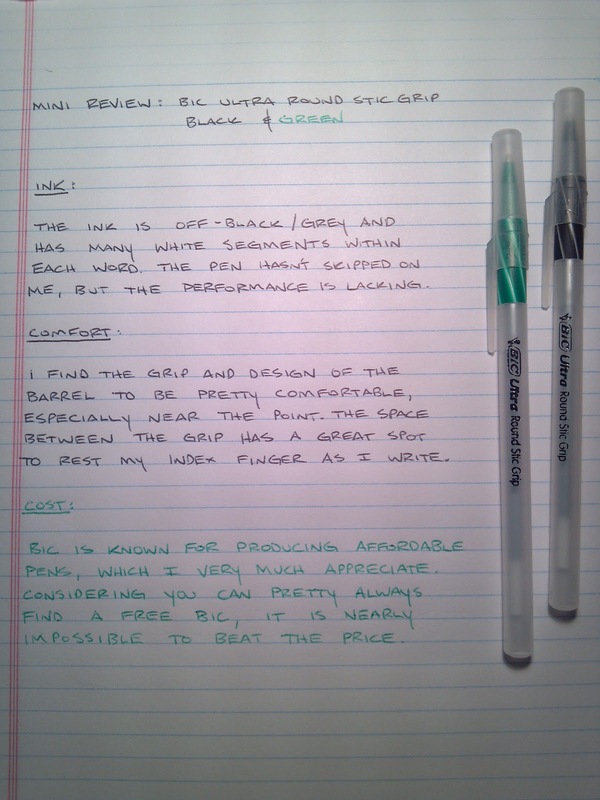 My first impressions were that it looked good, the price, $1.65, works well with my economy pens budget, and I have read mostly positive reviews about it, too. The ink, tip, barrel, and the feel of the writing itself all felt great. No complaints there. 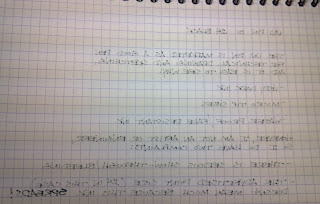 What surprised me is how much the ink spreads and bleeds, even on this 80g Rhodia paper (from the Rhodia Reverse Book). I have used pretty wet, medium point, fountain pens without this sort of result, and I think this could be quite messy on more porous paper, especially if you want to use the back side of the page.That being said, everything else was quite desirable, and I can see why this is a favorite for those who like to sketch or do technical drawings. Either way, I think comparable offerings, such as the Copic Multiliner or the Sakura Pigma Micron might be preferred in that they are less likely to bleed or cause show-through on the opposite side of the page. My other major complaint is that the indicated tip size does not even remotely reflect what will hit the page. This ink spreads, and you are more likely to experience a line in the .5 (maybe even .6) range over the .24mm suggested on the barrel. I am aware that manufacturers indicate the tip size and not the size of the line, but usually there is a closer relationship between the tip size and line than I experienced with the Uni Pin. 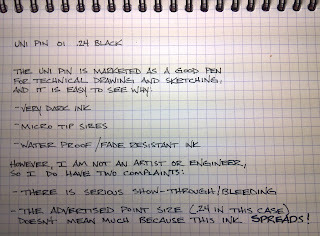 The backside of the page: I rarely see any pen cause this on Rhodia paper, so I was quite surprised. If you don't use the back page - and I usually don't - this might not be an issue. 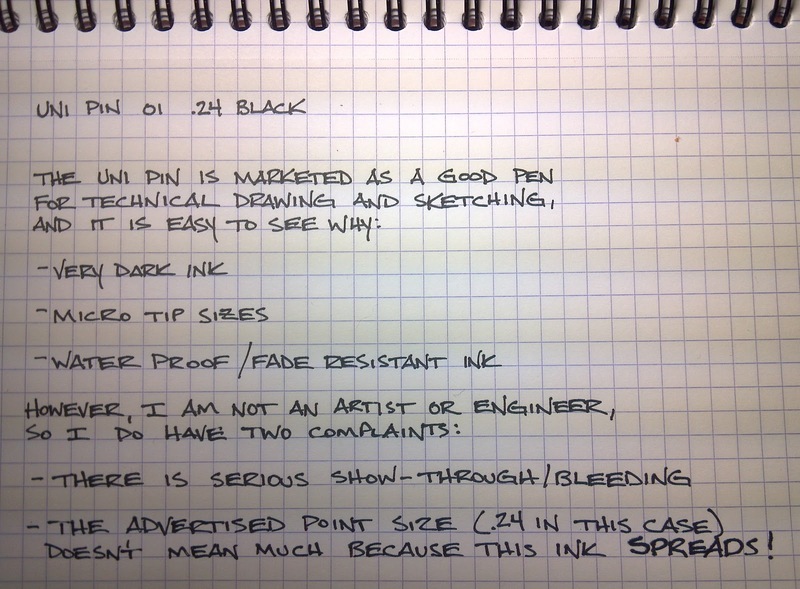 Bottom line: the Uni Pin is a great pen, so long as you understand what it will do for you. It will give you smooth, jet black lines. It will spread if you leave the tip on the page, and it will probably show on the other side of the page. I personally don't have much use for this pen, which is why it will also go in the next giveaway. Kum is well known for manufacturing great pencil sharpeners, so I picked up these two sharpeners to see if they live up the reputation. 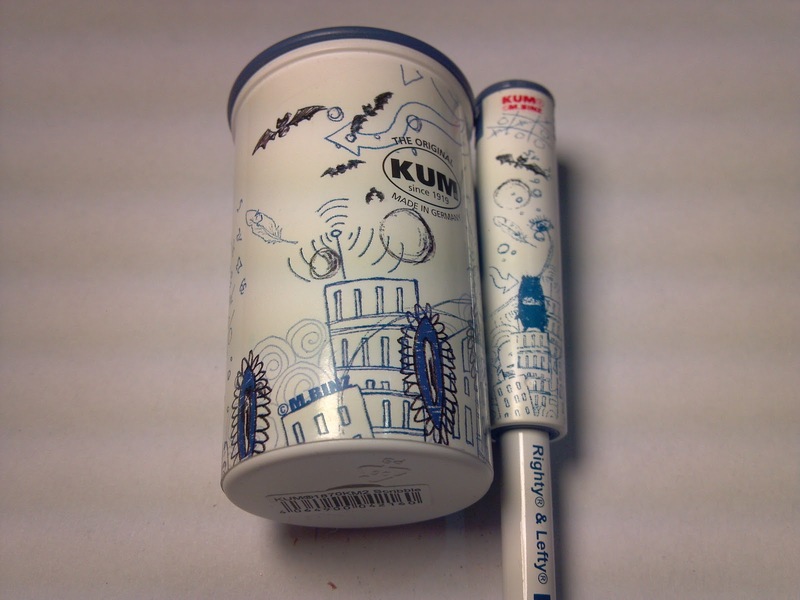 The one on the left is the Kum Scribble City; there is also a Kum Scribble Garden, which has different graphics, but both sharpeners are the same. 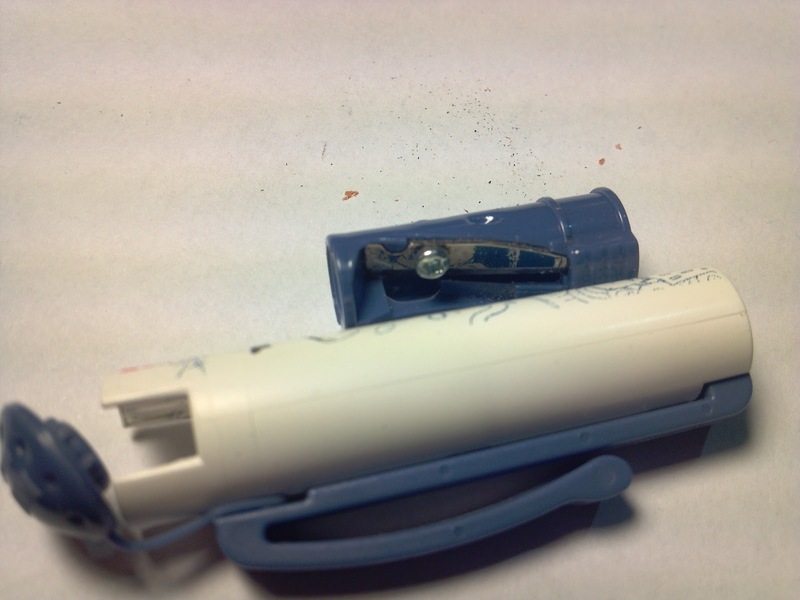 The pencil sharpener on the right is the Kum Tip Top, which comes with a matching pencil. Both of these items are available on JetPens for $4.00/each. The Kum Tip Top is a sharpener/clip combo that sits on top of woodcase pencils. There is a blue cap that houses the sharpener, and you can see the clip on the top left of the photo. The sharpener on the Kum Tip Top definitely stands up to what I expected from the reputation of the brand; it sharpens evenly and leaves a perfect point for using some good ol' fashioned graphite. 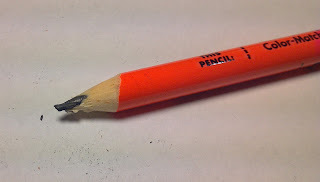 The sharpener component easily slides out of the pencil. I am not sure where to get refill blades, but, as you can see, there is a screw, which seems to indicate that one could change out the blades when this one becomes dull. The sharpener must be removed to empty out the shavings, and it doesn't hold many shavings, so I'd recommend removing the sharpener and using it directly over the waste basket to make sure you don't have graphite dust going anywhere when you don't want it to. 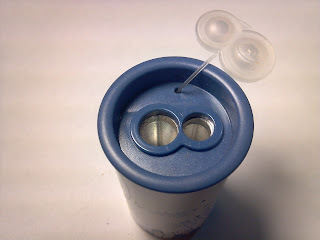 Here is what it looks like when you lift up the cap and remove the sharpener. 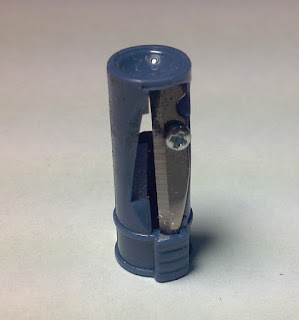 As you might have imagined, the sharpener component is quite small. 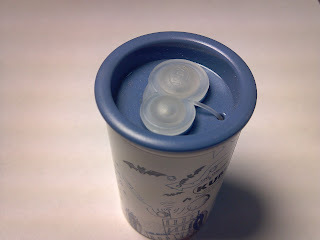 The incognito sharpener hidden safely under the cap. 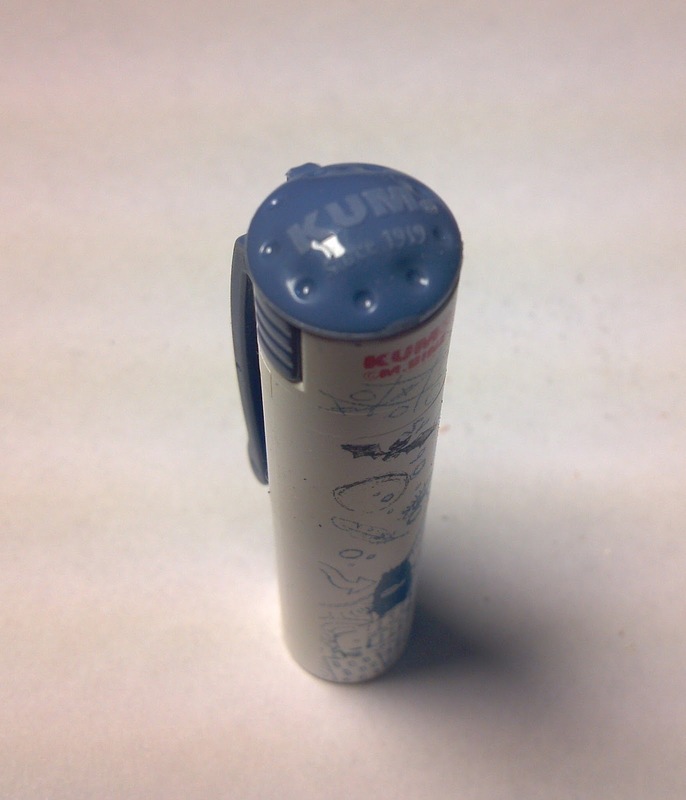 This is the Kum Scribble sharpener. I had been looking for a general sharpener to keep on my desk, so I thought this might work for me. There is a cap tethered with a plastic string. 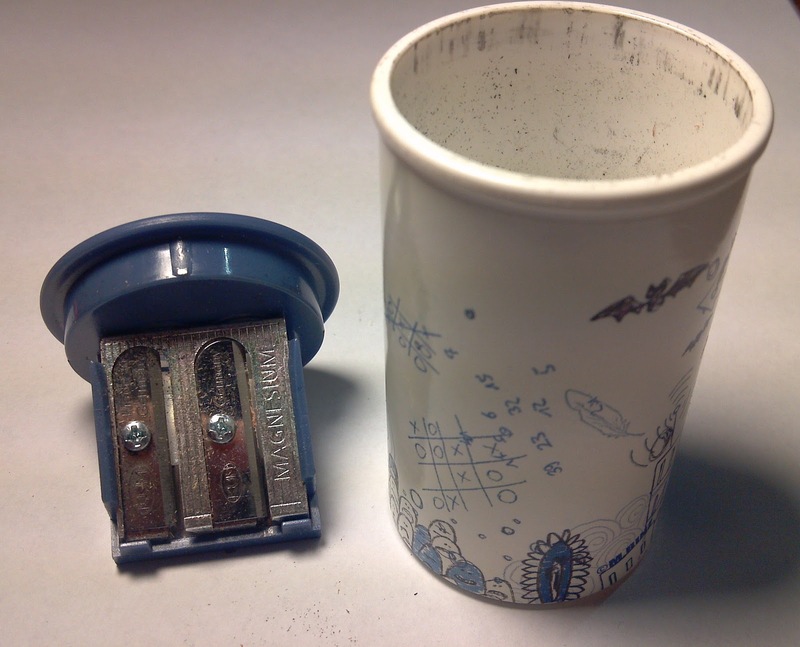 The sharpener has a standard size hole and a larger size, too. 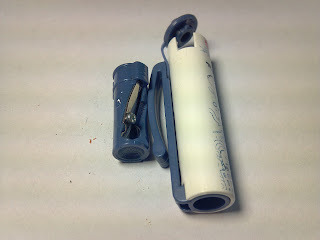 The sharpener itself is a fairly standard magnesium Kum sharpener. I have seen these at my local art supply store. Again, there are screws, but I never really see the blades available for purchase anywhere. Quite surprisingly, I had a terrible experience trying to sharpen one of my Field Notes Neon Ice Pop pencils. 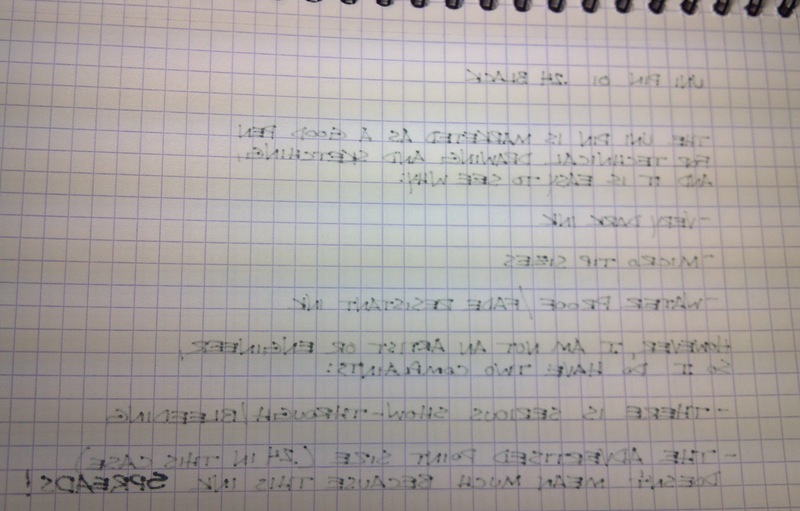 Time and time again, the result of using the Kum Scribble resulted in a weird twisted sharpening. I tried to adjust the angle of my sharpening and did this with multiple pencils but, alas, nothing seemed to correct this highly undesirable outcome. 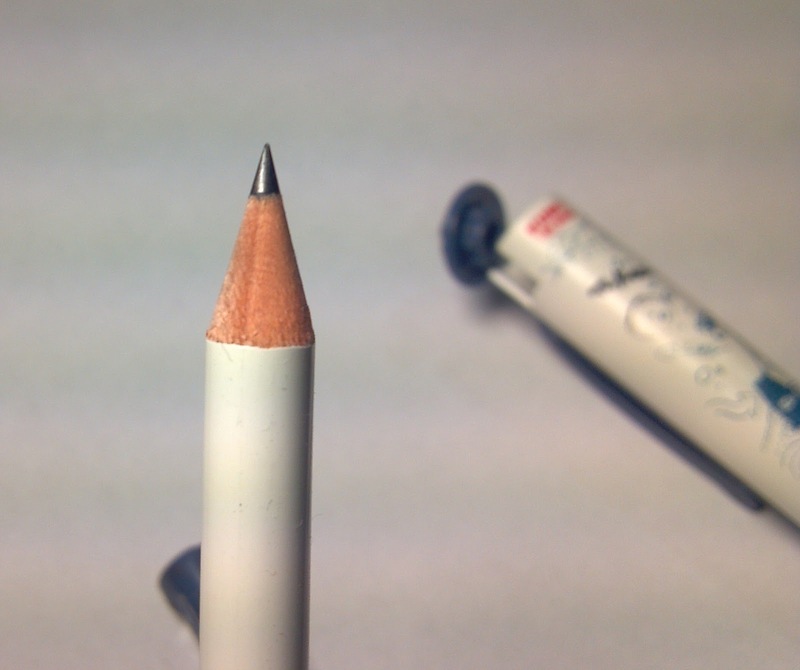 So, the bottom line is that the Kum Tip Top worked great, and it gives you the convenience of having a nice portable sharpener right at the top of your pencil, though it may not fit well if the metal ferrule is too wide. The Kum Scribble did not work well for me at all, but I am assuming this is probably a fluke. I have tried several other Kum sharpeners, all of which performed amazingly well, so I think this could be really good once the removable sharpener is replaced. I do have a few too many sharpeners lying around at this point, so both of these sharpeners will be given out in an upcoming giveaway. I will also be including the Daycraft 2012 Signature Diary from this posting and a couple other goodies, too, so stay tuned! JetPens Has MANY new items. Okay, so JetPens just added an alarming new quantity of goods. JetPens now has Field Notes, R&K inks, Kaweco (with extra-fine nibs), RayMay cases, and a lot more. I am already over on my office supply budget this month, but I have a few things I will be picking up soon. * I am not affiliated with JetPens in any way. I am not going to add much to this review. My thoughts are basically that Bic ballpoints serve a purpose, and I'd rather see someone using one of these than boycotting paper and pen altogether. Bic ballpoints are fairly reliable, easy to acquire, and, most importantly, they are cheap enough for everyone to acquire. They are the peoples' pen. I do say that generic ballpoints are going a bit far (Why buy a 12-pack for 39 cents only to find that most of them do not work?). I bought a bunch of affordable school supplies to donate, which I recommend if you have a few dollars to spare; there are many great deals during Back to School season at the big box stores, and a little bit of money can go a long way in getting kids some of the essentials. 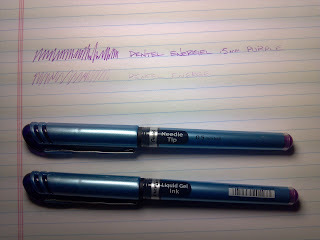 What was going to a be a review of the Pentel EnerGel .5 Purple is now going to be a small rant about quality. As you can see from the sample, I was not able to do a written review of this pen. 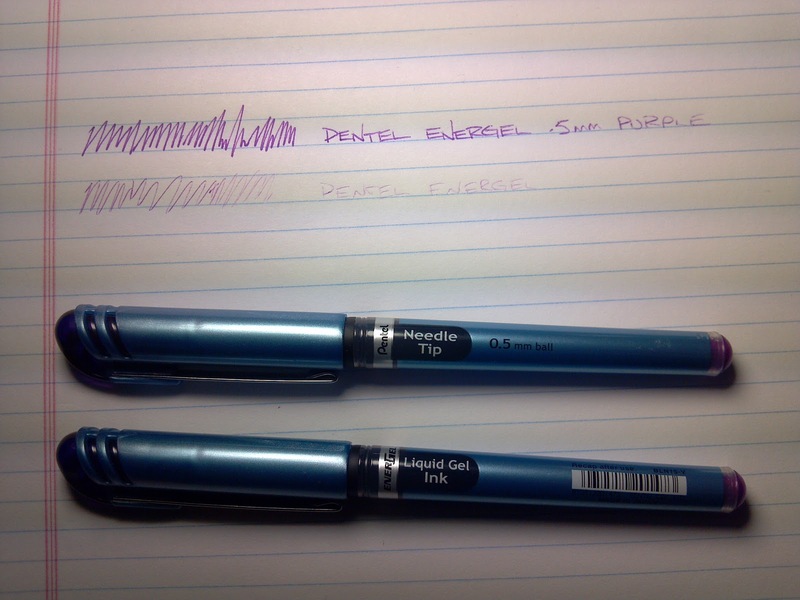 You might ask why I did not ask Pentel to replace the pen, but these two EnerGel pens are the replacement pens that Pentel sent to me after the first one didn't work. 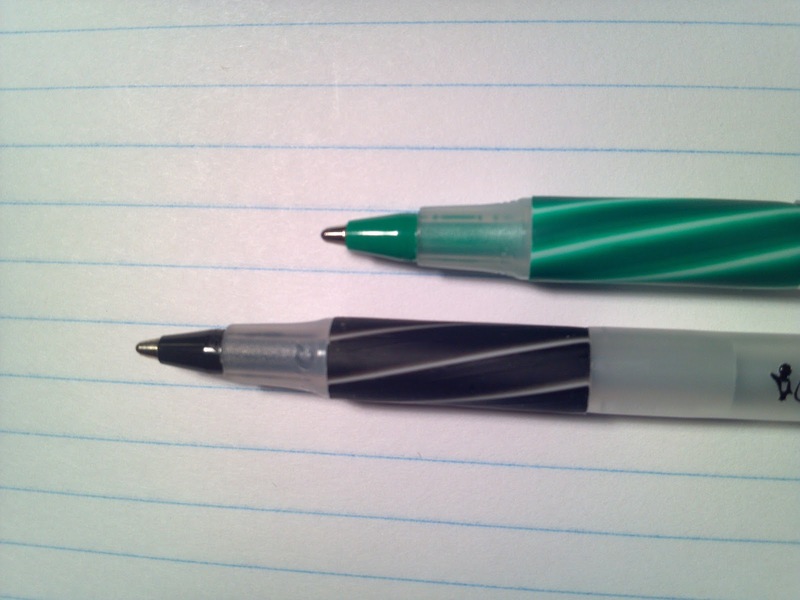 So, while they tried to make the situation right, the replacement pens suffered the same condition as the original, and I guess I would have assumed, incorrectly, that the new ones might have been tested prior to being sent to me.